My review of the new Asimov robot novel went up at Strange Horizons yesterday. In a way, the prep for this review was delightful; any excuse to return to Asimov's original Robot stories will do. To summarize, I guess: I wasn't blown away by Reichert's book as much as I'd wanted to be. But, given the material, I could have easily also been enormously disappointed, which I wasn't. 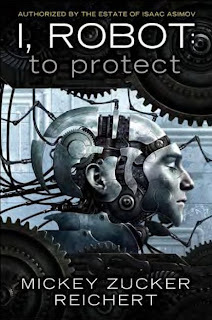 Though I'm not counting down the days until the next book in the trilogy is published (and I'm hoping it's not called I, Robot: To Serve or I, Robot: To Uphold), I'm looking forward to it, and the chances are fairly good that I'll actually read it. I had mixed feelings--and in some ways even contradictory ones--about the first volume, but I tried to offer a balanced perspective in my review. If you've read this book and have an opinion you'd like to share, I'd love to hear from you, either here or in the review's comments section at SH.